Don't miss this special viewing of “Con o Sin Papeles (With or Without Papers)”, produced by Pacific alumna Aria Zapata. 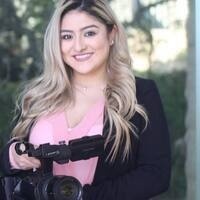 Zapata graduated from Pacific in 2016, with her bachelor's degree in communication. She later went on to pursue her graduate degree at the University of California, Santa Cruz, and was part of one of the most innovative and progressive programs in the Arts Division. The Film and Digital Media Department’s Master’s program in Social Documentation is designed for future documentarians committed to social change and to documenting communities, cultures, issues and individuals. Labor rights activist Luis Magaña takes daily drives through the San Joaquin Valley’s agricultural fields, trips that introduce the audience to the world of migrant workers and highlights immense injustices. This documentary tells the stories of Juan and Keyli, who are young and motivated migrant workers. As the two journey on their contrasting paths—whether to stay or to leave—Juan and Keyli share sentiments of feeling unwelcome and consigned to outsider status. History repeats itself as tactics of exploitation and abuse are enacted upon a new generation of workers. Yet, one strong-willed man can spark hope and instill courage: in these fields, Luis Magaña is a guardian angel.